WORLDWIDE: Nordex has launched its Delta turbine series, an upscaling of the company's existing 2.4/2.5MW product platforms. The focus is on a 3MW N117/3000 flagship model with 117-metre rotor diameter for low wind IEC class IIA conditions. Additionally, a 3.3MW N100/3300 sister model will be available for high-wind class IA sites. The N117/3000 is claimed to offer on average 31% higher annual energy production compared with the current biggest 2.5MW N100/2500. Prior to the launch at EWEA 2013, Eize de Vries spoke with Nordex head of engineering Jörg Scholle on the new product’s background, main features and target market. Nordex has described the product development focus behind Delta as evolutionary and customer-driven. "Our clients appreciate modest technology steps with a low risk profile. For Nordex, additional benefits include faster time to market and substantial reduction in product development risks and cost," said Scholle. Product features include an in-house developed lightweight NR58.5 rotor blade with carbon fibres incorporated into the load carrying main girders. These blades weigh less than 11 tonnes and are again applied on the N117/3000. Scholle said: "Despite the N117/3000’s higher wind class with increased load levels we added only some extra carbon layers to the main structural girders as the only necessary upgrade. Both NR58.5 blade versions are produced in existing moulds. Positive operational experiences with over 50 N117/2400 turbines add to our confidence that we are on the right technology track with these high-tech blades. Earlier generation NR50 blades developed for the N100/2500 will instead be fitted unchanged to the N100/3300. For the N117/3000 turbine noise could be curbed to a maximum level of 106.0 dBA and for the N100/3000 to 105.5. Scholle: "Low noise is a key factor onshore, as it widens planning options and offers greater flexibility when allocating wind farms in or near constrained populated areas, like placing turbines closer to buildings." The Delta high-speed drive system layout closely resembles that of Gamma turbines, including a three-stage gearbox with three-point support, doubly fed induction generator and partial converter. The nacelle is made wider for accommodating the bigger gearbox and other components and enhanced service friendliness. Scholle said: "A fully ‘flat’ internal working area offers easy components access, improved working safety and ergonomically optimised working conditions. Hub access from inside the nacelle is a new Delta feature considered crucial for meeting today’s customer demands." Key European target markets for the N117/3000 include the Netherlands, northern Germany and typical cold-climate wind markets Norway, Sweden and Finland. "For these Nordic countries we offer a cold-climate version as well as an anti-icing system integrated into the skin’s laminate. Another market focus is at repowering projects. Typical markets for the N100/3300 include Ireland, the UK, Norway, Turkey and the US, especially New England", he added. The N117/3000 is available with two tubular steel towers of 91 and 120-metre hub height. For the taller option, mass optimising and road transportation proved key design challenges. The third option is a hybrid concrete-steel tower with 141-metre hub height, but this reduces applications to IEC class IIIA sites. The company will install three prototypes in Denmark and Germany during Q2/2013 followed by five pre-series turbines in the second half of the year. Serial production ramp up is planned for early 2014. 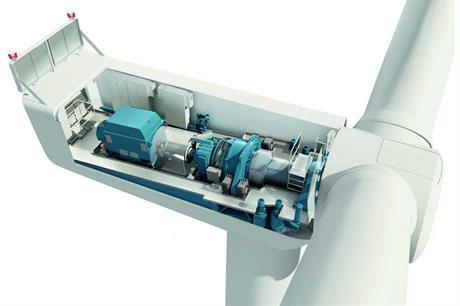 Nordex late 2010 announced a next-generation 3-4MW medium-speed onshore turbine concept with permanent magnet generator, up to 4,000 square-metre rotor-swept area per megawatt (124–143m rotor diameters) and segmented blades. When asked about the status of this ambitious project, Scholle said he could not offer any comments at this stage.